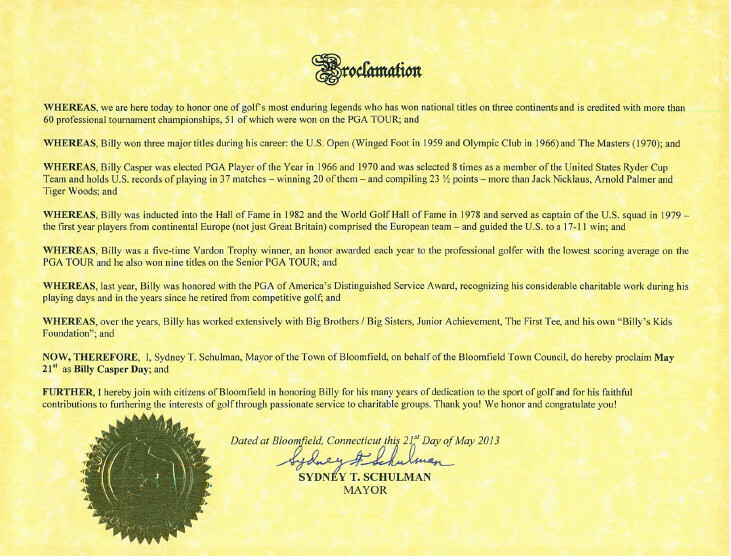 Did you know May 21 is Billy Casper Day in Bloomfield, Conn.? The community of Bloomfield, Conn., takes a lot of pride in Wintonbury Hills Golf Course, for a lot of reasons. For starters, it's the only Pete Dye-designed golf course in New England. That Pete Dye design has been so well received that Golf Magazine ranked Wintonbury Hills as the No. 6 public course in the United States. And Billy Casper Golf has been there from the beginning with the decade-old course. Last year, the city of Bloomfield wanted to recognize BCG's namesake, Billy Casper, for all of his achievements, not only in the game of golf, but also as a humanitarian. That's why May 21 is now known as Billy Casper Day in Bloomfield.